Excel Paste Special functionality can save a lot of time. One of its features is ‘Operations’, which allows us to quickly perform mathematical calculations (such as addition, subtraction, multiplication, and division) on a range of cells. 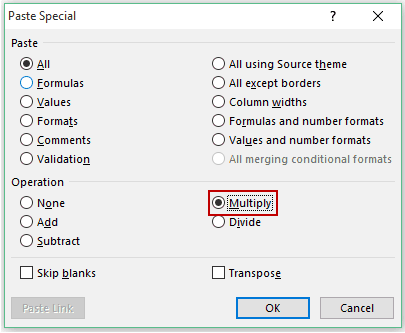 In this tutorial, I will show you how to multiply in Excel using paste special operators options. These come in handy when you want to avoid applying formulas or using helper columns. Suppose you have the data set as shown below. 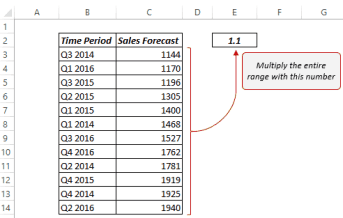 These are sales forecast numbers, and you need to increase these forecast values by 10%. One way (the long and tedious one) to do this is to use a helper column and first calculate new values by a formula, and then paste the new values in place of old values. Another (quick and awesome) way is to use Paste Special Operation feature. Copy the value in cell E2 (1.1) [Use your favorite keyboard shortcut – Control + C]. Select the entire range which you need to multiply (B3:B14). Go to Home –> Clipboard –> Paste –> Paste Special. This opens the Paste special dialogue box. A quick way is to use the shortcut Alt + E + S.
In the Paste Special Dialogue Box, select Multiply. Step 3 and 4 can be done by the shortcut Alt + E + S + M.
If you are not using the value in Cell E2, you can delete it. This will replace old numbers with new numbers. No Problem at all!! This trick works with numbers as well as formulas. What if You want to Change every Nth Value Only? Suppose you want to revise the forecast numbers of Fourth Quarter Only (while the remaining numbers should be the same). This can be done using Paste Special Operation Feature with this nifty tip. Copy these four cells instead of a single cell, and follow the same steps as described above. This works by multiplying the first 3 values with 1 and the fourth with 1.1, and so on. 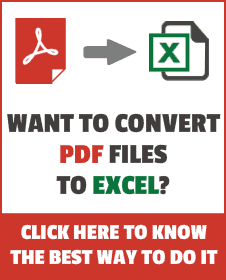 24 Daily Excel Issues and their Quick Fixes. Show Formulas in Excel Instead of the Values. 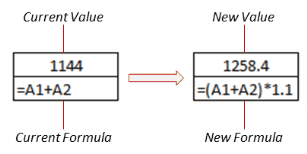 Understanding Absolute, Relative, and Mixed Cell References in Excel. Thank you for the Ebook! Seriously I’ve been imagining this thought! Thanks to our MVP Sumit Bansal. Thanks for commenting Phil.. Currency conversion is a great use of this technique. I have used this for conversions such as millions to billions or grams to Kgs.